The 54th National Austin 7 Rally takes place at Beaulieu on Sunday 3rd July and a particularly famous racing Austin 7 will be joining a special display of ‘Sports & Racers’ that will complement the huge variety of road-going Sevens and associated marques that come from all over the UK and Europe to attend this flagship annual event. Simplicity has a fascinating history. Just after the Second World War, Holland Birkett of the 750 Motor Club proposed a low-cost racing format based on road-equipped Austin Sevens. Jack French took up the challenge and over the period of five weeks of evenings and weekends ‘Simplicity’ was built. The car was assembled from readily available parts: a short chassis, three-piece rear axle, and a mildly tuned engine. To obtain greater overall performance the chassis was considerably lightened by drilling in excess of 250 holes ranging in size from ¼” to ¾”. The first race meeting was at Ibsley in Hampshire on April 18th 1953 when Steady Barker won in Simplicity and 1959 saw Jack French set a Vintage Class record at the VSCC Prescott Hill Climb with a run of 51.95 seconds, a record which stood until 1966. Very few changes have been made to the original concept of the car and it is still predominantly as it was built by Jack French. Passing through several hands Simplicity is now owned and competed in sprints and hill climbs with the VSCC, and in the Bert Hadley Championship with the Pre War Austin Seven Club, by Graham Beckett who will bring the car to Beaulieu. The Rally is open to all Austin 7 owners regardless of whether or not they are 750 club member. Austins form the core of the event, but pre-1975 vehicles of all makes are invited to attend and will have a designated parking area on the rally field. 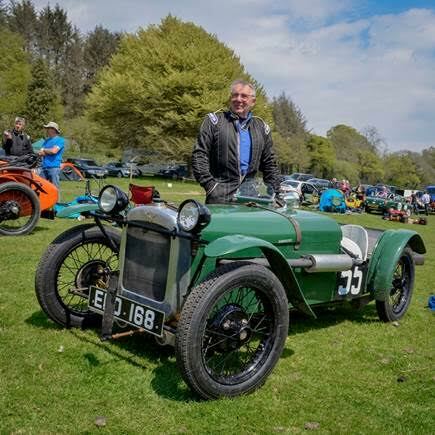 The National Austin 7 Rally is an ideal day out for enthusiasts and for families alike. Beaulieu is home to a wide variety of attractions and the rally entry ticket also gives access to the historic Palace House and Gardens and The National Motor Museum. The event is sponsored by Warranty Direct Limited and RH Specialist Insurance.